Headlining this after-action report: I did not win an Aurealis Award. Watch this, Lise. You can actually pinpoint the second when his heart rips in half. The gong in my category, Best Fantasy Short Story, went to the very deserving “Where the Pelican Builds Her Nest” by Thoraiya Dyer from the In Your Face anthology. (I highly recommend the anthology, although be warned that many of the stories are confronting, if not gut-wrenching). My sincere congratulations to Thoraiya, who is one of my favourite Australia fantasy authors. 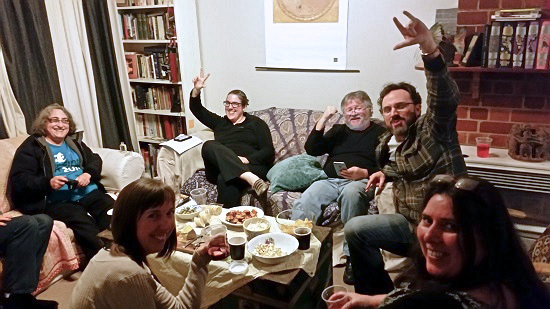 A dozen or so Canberra writers gathered in the chilly northlands to follow the action on Twitter and Facebook, whilst swilling various warming beverages in a convivial air. Our host Ian McHugh even stoked the fire pit so we could sit outside toasting marshmallows and more effectively disturbing the neighbours. For lingering evidence of how the evening went, you can search Twitter for the hashtag #Fauxcon. I accept no responsibility for anything you may find if you conduct that search, but consider this a content warning for bad language and ribaldry. And happily, we had winners in attendance on the night. Tim Napper picked up his first Aurealis Award for “Flame Trees” in the Best Horror Short Story category, and Kaaron Warren won Best Horror Novel for “The Grief Hole”. Both were over the moon at their wins (“over the moon” was not the expression we used on the night, by the way). Leife Shallcross, who graciously agreed to deliver my acceptance speech in the event of an incredible upset, got to deliver her own speech – she won Best Young Adult Short Story for “Pretty Jenny Greenteeth”. So it was a pretty good night for the CSFG crowd. And I was delighted – very loudly so – when my friend Andrea K Höst won Best Fantasy Novella for “Forfeit” from her self-published collection The Towers, The Moon. “Forfeit” is a fabulous romantic adventure set in her Trifold Age series, and might be my new favourite work in her impressive catalogue. Huge thanks to the Aurealis organising committee for another fantastic effort in coordinating the judging panels, trophies and ceremony. They do an amazing and important job each year – thank you Katherine Stubbs, Tehani Croft, the judging panels and everyone else involved. Thanks too to the committee for providing a live stream of the ceremony on Facebook so that we could watch the action unfold. My phone reception wasn’t up to the burdens of streaming video, so I missed the announcement in the moment, but for the record you can scroll to 13:30 on that video to see my category being presented by the lovely Satima Flavell.Congratulations to all this year’s winners and commiserations to my many fellow runners-up. I feel like I am in the very best of company. And I’m not heartbroken in the least. This entry was posted in Writing news and tagged andrea host, aurealis awards, ian mchugh, kaaron warren, satima flavell, t r napper. Bookmark the permalink. What a talented bunch of writers you are … especially CSFG. It was such a lovely way to spend the evening. I really enjoyed the company. Fingers crossed we’ll both get to do it again next year. It was! And while I am certainly treating my nomination as a lucky one-off event, I very much enjoy the camaraderie and bonhomie of an award night. Even when I’ve nothing in particular at stake I find them fun. I suspect such a celebration would be even more fun when you don’t have anything at stake. It makes it easier to relax and have a good time.